Financial Systems: Including general ledger, asset management, budgeting and receivables. HR Systems: Covering payroll, recruiting, personnel and benefits tracking. Supply Chain Systems: Business systems that manage parts and logistics. Manufacturing Systems: Software and servers that regulate the processes of manufacturing. These manufacturing systems include work orders, schedule planning, bills of materials, costing, and the management of the manufacturing systems. Project Management: These are also part of enterprise project management (EPM) systems. Customer Relationship Management (CRM): CRM systems are extremely important to a company's sales team. Not only does it manage and track customers and sales opportunities, but it can also cover marketing and commissions programs. Oftentimes these systems can turn out to be an isolated source of data and functionality. Your organization may have trouble integrating their ERP systems together, or with other systems. Another common issue is giving access to the systems for employees in a global workforce. Before modern advances in technology, ERP systems were often seen as large, bulky operations that were required to reside onsite with the enterprise. Now it is much more common to see companies migrating at least some, if not all of their ERP operations to the cloud. Use your due diligence when deciding to move your ERP to the cloud, but do keep in mind that it is an option that can solve many problems and save many resources. By moving a business system to the cloud, you immediately give more accessibility to those employees and users who require access to it. By having a secure cloud deployment, there is no increased vulnerability of any business data. However, now any authenticated user that has access to the web can get into the system. This can be very beneficial for geographically distributed companies. This enables remote sites to integrate their data with the primary site. Roll-up reporting has been made much easier, and overseeing global operations can be done from a dashboard instead of setting up and maintaining a wide area network (WAN). Additionally, once the ERP system has been deployed to the cloud, it becomes much easier to integrate other systems with it. (eCommerce, payroll, inventory management systems, human resource management systems etc.) 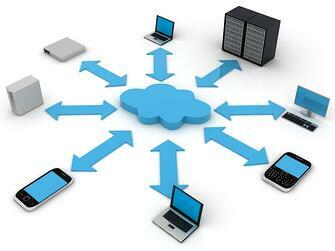 The cloud system maximizes interoperability and access. Connecting ERP systems together, or to another auxiliary system becomes an easier process with the cloud. Reporting and business intelligence systems can also connect to your ERP system(s) the same way. If you are looking at bringing your ERP system(s) to the cloud, or have any questions about cloud hosted ERP's or Sage 300 ERP (Accpac) please contact Equation Technologies.